It is the beginning of the year, so that means it is time to set goals. One of those goals should be how many books your students should read by the end of the year. If The Book Whisperer was on your summer reading list, you’ve probably set 40 books as the goal for your students. Whatever your goal may be, one thing your students need is access to quality books. You may already have a class library. But is there such a thing as too many books in a class library? No, I don’t think so. There are a different ways to get more books for your library. One way is to send home the note above and ask parents for donations. You will usually get a good response for this at the beginning of the school year and around the holidays. These are both times when parents are cleaning out (clothes) and books that no longer “fit”. 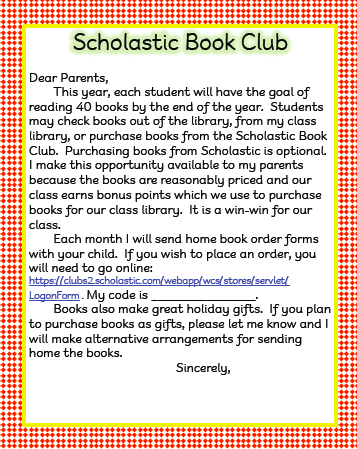 Another way is to order books through Scholastic. Your students order reasonably priced books and you earn bonus points for organizing it. You may purchase books with your bonus points. 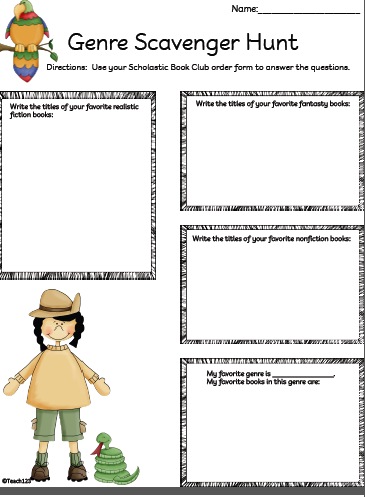 To build interest in the book order, I suggest having a genre scavenger hunt using the book order form. Let students work with a partner to complete this assignment. Click HERE to get a copy of the genre scavenger hunt and Scholastic parent letter. « Looking for new ideas? These are interesting ideas. I'll have to explore all of this further. Thank you for sharing this at TBA and linking up! I read The Book Whisperer this summer and my entire team was going to do it! We were so excited…but then got changed back to Math and Science….I think it is wonderful and can't wait to follow your year! I know that this is an old post, but I had to let you know about another way to get free books. Every year I get 20 free books from the Sunny D Book Spree. If you send in 20 bar code labels Sunny D will send you 20 free books via Scholastic. Check out their website for more information.